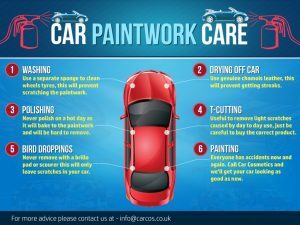 A breakdown of useful tips when looking after your car paintwork. When you wash your car there are a few things you will need to remember because there are certain tools that you use and also there are certain things that you would not want to use. So before you begin to wash your car you will want to find out what is the best way. The first thing you will need to do is rinse the car with plain water. This will ensure the entire car gets wet. Once the entire car is rinsed off, you will want to make sure the area you are currently cleaning stays wet so that it will be easier to clean. When using a sponge to wash the car, you will not want to use one that has a scratchy surface because it will cause scratches to the car paintwork. Not only will you need to use a soft sponge but it will also need to be clean. If the sponge you are using gets dropped and lands on the ground, you will need to clean the sponge before you use it on the car again because the grit from the ground can scratch the car. When using a sponge to wash the car never use the same sponge for the tires, or rims. If you use a different sponge on the tires than you do on the car, you will prevent further scratching of the car and remember to use a fresh bucket of water too. Once you have thoroughly cleaned the area you are working on, make sure to rinse off the soap before moving on. It is very important that the soap does not dry on the vehicle. When soap begins to dry on the car, it will leave a residue. Always go back and re rise the car many times so that you are sure that all the soap is off. Using a sponge on the car when cleaning it is one of the best things you can use because it is soft, durable and will ensure that your car stays scratch free. Never use anything else to wash your car. 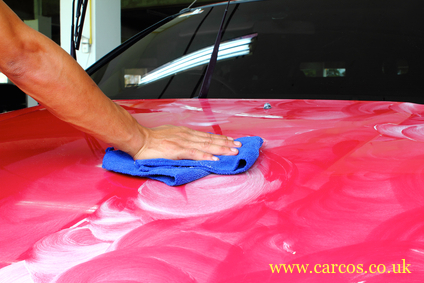 If you want your car to come out shiny and ready for a good wax or polish, then you will need to dry your car properly. This means that unless you happen to have an industrial strength blower lying around, you are going to have to do it by hand. The first step in drying off your car is to give it a really good rinse. Soap and other cleaning products are designed to stick to dirt. This means that they stick to other things really well too, like your car paintwork. So don’t be shy about running the hose over your car for a few minutes longer even if all the soap bubbles have disappeared. You can’t over-rinse. Water actually helps dry your car because water likes to stick to water, and when water runs off your car, it pulls more water with it. Science is awesome. Next you will use a real leather chamois or a special drying towel to clean off the body of the car. Bath towels and such are not recommended because unless you spent over £100 on one towel then they are too abrasive for your car’s paint job. They are also designed to dry things a lot smaller than a car so they don’t really hold that much water compared to their size. Chamois soak up a lot of water and are easy to wring out so that they are ready to soak up more. Plus, they are non-abrasive to your car paintwork so won’t take a beating. Squeegees are also another good option they conform to the shape of the car body and do a great job of dragging all of the water off of the panels. Make sure to make overlapping passes with the squeegee or else you may leave lines of water behind that will dry into ugly streaks. Whether you choose a chamois, a squeegee or both, it is important to get one that’s good quality. You can buy both of these items at our Ebay Store (click here). There are some “experts” who dry their car with a leaf blower. This is okay as long as you, your car, and the leaf blower are in a vacuum. Any tiny bit of gravel or dust that gets between your car and the blower will be permanently embedded in your car paintwork. With chamois and towels, you can control the pressure and speed of the drying process. So don’t try to cut corners, don’t rush the job, and don’t be afraid to use water to help dry off you car. Polishing your car is a time consuming multi-step process that requires quite a bit of elbow grease. Make sure that you start with the car being as clean as possible. Give it a thorough wash and then let it dry completely before you start polishing. You may also want to have some wax to apply after the polish is done. This will add a second layer of protection to your car paintwork. To start with, you will need foam applicator pads and a polishing agent. Both of these can be purchased from Car Cosmetics at our Ebay Store. We have over 15 years worth of experience in car body repairs and restorations and have chosen the best products to offer to our customers. Remember that the cheap stuff is cheap for a reason. Buying the cheapest stuff may save you a few pounds now, but you’ll get longer lasting results from better brands that may cost a bit more. When you start the polish, pick a low profile part of the car so you can test the polish you bought and get used to the polishing process. Pick an area about one foot square, apply the polish directly to the foam pad, and then begin working the polish into the surface of the car. Apply firm pressure and move your hand in a circular motion. As you work, the tiny abrasives in the polish will begin to buff out minor scratches and imperfections and the friction will cause the polish to break down into a protective barrier for your car paintwork. While polishing, the actual polish will go through a few stages of appearance. It will appear almost opaque at first but will become more and more translucent the more you work it into the car. Many stop polishing too soon and end up with their car paintwork having a hazy appearance. Keep working the polish until it has become invisible. You should not be able to look at the car and see any actual polish remaining. This is why it is best to polish in a well-lit garage or in on a sunny day. Continue moving around the car working in small sections. Once each area is complete, use a microfiber cloth to wipe off any remaining polish reside. By the time you are done most of the small scratches and scuffs should be gone and you will see no polish or a slight oily appearance. Now would be the time to apply a new coat of wax to add another layer of protection. You’ve washed and polished your car, but you noticed that there are still some scratches hidden in the car paintwork. Don’t feel bad. Unless you leave your car in the garage year-round, scratches are going to happen. For the scratches that are too small to spend lots of money to fix yet too big to forget about, there is T-Cut compound that you can use. A T-Cut compound is a paint restorer that has been around for over half a century. It’s one of those products that everyone buys because it works. Take a peek into any body shop or the garage of a car lover and you’ll find some T-Cut compound sitting on the shelf somewhere. If your car has a few small scratches, check out our selection of T-Cut compounds here and once bought follow in the footsteps of entire generations of car lovers who have come before you. Here’s the thing: Don’t try to use a T-Cut compound unless you are serious about the job. It doesn’t take an Oxford education to use a T-Cut, but it’s also not something that you just wipe on without reading the directions. First, your car paintwork needs to be clean. If you’ve been following the rest of our advice your car has been properly washed, dried, and polished by now. All that’s left to do is finish off a few scratches. Next you’ll need a soft, clean cloth. Cotton is your best bet. Avoid anything with scratchy fibers or rough seams. Apply your T-Cut compound to the cloth (not to the car!) and firmly rub the area over the scratch in a circular motion. Eventually, the compound will begin a cutting action into the top layer of lacquer. The scratch will be gone, but you now have an area on your car where the paint is a few microns less thick than in other areas. This means that you need to make sure that this area is treated well, preferably by keeping the car polished or waxed on a regular basis. Like I said, it’s not rocket science. But you also need to make sure that you buy the right T-Cut product for the job. All of these T-Cut products are available from our Ebay store. Please feel free to contact us if you have any questions about which grade of compound is right for your car paintwork. Bird droppings can damage your car paintwork in a variety of different ways that leave your car looking less than perfect. Although it was once thought that the acid in bird droppings were the reason that bird droppings damage your car paint, the common consensus for why this happens has been changed. The paint lacquer that coats your car is very hard when it cools, but once sun hits the paint lacquer, the lacquer begins to expand and grow softer. Although the paint lacquer is softening, the sun hardens the bird droppings by drawing out any moisture that was in the bird droppings and leaves a hard deposit on the vehicle. Once the sun goes down and the paint lacquer is able to cool off once again, the lacquer tends to contract back down to its normal size, but with the obstruction of the hard bird dropping in the way, the lacquer then shapes itself around the bird dropping. This is why bird droppings damage your car paintwork, because paint that has been molded around a surface is misshapen and can then flake off much easier. This leads to chipping of paint and a variety of other things that detract from the overall appearance of your vehicle which can damage your vehicle. In order to ensure that the bird droppings do not damage your car paintwork, it is important to take a moist rag and remove the bird droppings from your vehicle in order to remove any possibility of the paint lacquer being damaged from the contracting nature of the paint as it cools. 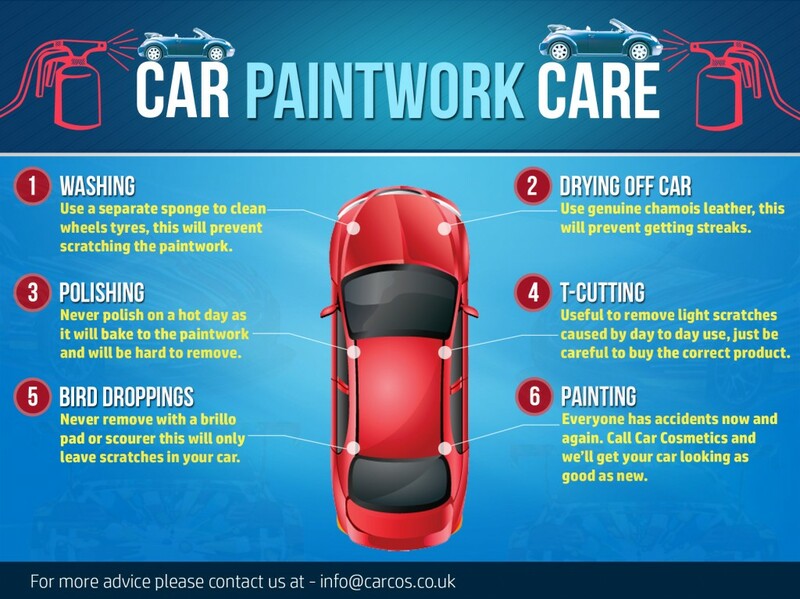 A infographic image of car with points on how to care for you car paintwork.